For more than ten years, Junior League of Peoria volunteers spent countless hours researching the feasibility of a children’s museum for Central Illinois and have taken great care at every step to work with experts to make their dreams of a world-class children’s museum for Peoria a reality. The Junior League officially joined forces with the Peoria Zoological Society and the Peoria Park District to launch the Power of Play campaign in 2012, which focused on revitalization of the campus at Glen Oak Park. The PlayHouse opened to the public in June 2015. Together, the PlayHouse, the Peoria Zoo, and Luthy Botanical Garden offer a daylong destination for families and school groups. 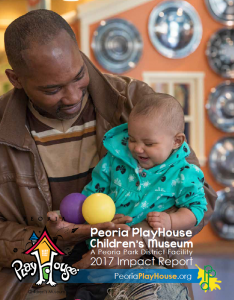 The Peoria PlayHouse Children's Museum provides children with the tools and inspiration they need to be explorers and creators of the world. We do this in part through understanding, supporting, and promoting play in the fullest sense of the word, one that includes imagination and creativity. We believe that a kid can be anything they want to be. They need only the opportunity and inspiration to imagine, practice, and become. We believe that we are more effective when we collaborate with others. Collaboration with individuals and organizations throughout and beyond Peoria allows us to effectively support families and achieve shared goals. We believe that the PlayHouse is for all children and families, regardless of income, abilities, or background. We believe that we are catalysts. A good museum experience sparks experiences and ideas that happen after and between visits. Who knows where a visit to the PlayHouse might lead? Our 2017 Impact Report is now available, and can be found here. Read our 2016 Impact Report here.